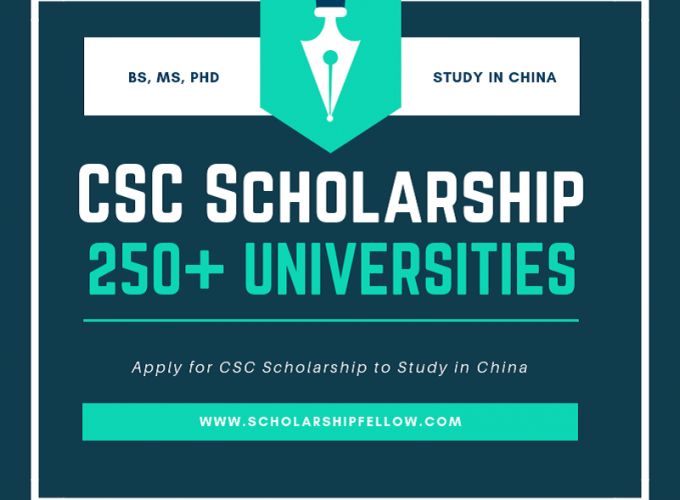 CSC Scholarships 2019 are now open for Bachelor, Master or doctoral (Ph.D.) degree courses in various disciplines taught in English & Chinese language in Chinese Universities. CSC Scholarships is offered in over 243 Chinese Universities every year. An online application for CSC Scholarships is a mandatory requirement. Whereas, an applicant of the CSC Scholarship is also required to submit another University admission application to the university. After that, the CSC Scholarship applicant has to submit both the CSC Scholarship application form and University admission form directly to the University to process the application. Chinese Government Scholarships initiative was taken by the Chinese Government to promote education, culture, trade, exchanges in education and politics, cooperation and mutual understanding between other countries and China. Every year, Chinese Universities are awarding Chinese Government Scholarships such as CSC Scholarships, Confucius Institute scholarships, CAS-TWAS Scholarships, Chinese Provincial Government Scholarships and many more scholarships to international students. -Step 2: How to submit the CSC Scholarship application to the University? -Documents Required for CSC Scholarship Application? Acceptance letter (Consent Letter) from a professor of Chinese University is optional. Motivation Letter is recommended while you send emails to professors to request an acceptance letter. Write a detailed and impressive research plan and state clear reasons that why you want to chose a Chinese University for your next degree? Master degree students can write a Study Plan for CSC Scholarship. The Study plan essay and Study plan writing skills were also published for you to look at. You may also wish to read how to write a well-researched research proposal to convince the scholarship awarding committee. It is advised to choose a reliable courier service to send your CSC scholarship application documents directly to the address of that Chinese University. If you win the CSC Scholarship then the next step will be to receive admission and Chinese Student VISA documents on your residential address. Now, you have to make an appointment to visit the Chinese Embassy to apply for a Chinese VISA.